Patter is what we say as we perform our tricks. I never realized what an impact patter has on the effect. I know its not the magic, its the magician. But the magician can know all the sleights and perform the effect perfectly, but unless he is doing a silent act, which requires no patter, but gestures, its all for naught if his patter isn’t thought out carefully, but flows seamlessly. And of course the timing of the patter and the moves of the trick are like a dance. They are partners. Of course the pros know all this, but if you are not a pro you may not know that patter is a serious business. Books have been written on the subject, Sid Lorraine’s PATTER for one ( and then he wrote More PATTER) and Gene Gordon’s Laughter Legacy for another. When their finger is in the deck I say “Take out the 3 of spades.” They look at me confused. “Just take the card”. They take the card, look at it and its the 3 of spades. Jaw drops. “Have you any idea of how I knew that?” Either they say, No, or It’s a marked deck or they are all 3 of spades. It doesn’t matter what they say, it only matters what I say and I have an answer for each one. If they say the latter, I say, “Oh, you’ve seen the trick before.” and they say no, and I show them that all the 3 of spades. And they are so pleased with themselves that they figured it out and feel a little sorry for me that I didn’t fool them. And then I say, “But you know, anyone could do this if they had a deck full of 3 of spades, so it really isn’t such a hot trick, is it?” They agree. So with a wave of my hand, and a magic word, the whole deck changes to a regular deck of cards. Jaw drops again and the trick is sold. I could have speeded up the trick.. He takes a card, its the same as all the other cards and then the deck changes to a regular deck, but we wouldn’t have had so much fun. He will still wonder how I did that, but he wouldn’t have had all the emotional stuff that goes with it. But that is only one aspect of patter and its not even the one I was going to discuss today. There is a more practical and necessary use for it, which I will discuss in my next post. Stay tuned. Magic Critique: Can YOU Handle The Truth? So you worked out a routine. You thought it was great. You showed it to your Mom. Who else? Maw, watch this. Maybe your significant other. Of course you want to hear them say its fantastic. Is that what you want to hear? What if they see ways it could be improved or in performing you inadvertently reveal what you are doing. A young boy, 8 years old, showed me tricks he was going to do for his class. Simple tricks, that he handles easily. Problem: presentation. I was fighting with myself whether to correct him or not. Isn’t it enough he gets up in front of the class and does magic. Do I really expect him to be a performer at 8. But he did ask me. So I told him. Look at your audience when you talk to them, which he didn’t do. Don’t tell them in advance what you are going to do, which he did. It takes away the surprise. He explained to me that he had to talk as that was part of the presentation. (It’s in French, not his mother tongue.) So we changed the words around, so he could talk without giving it away. And one trick he wanted to do that I did not consider appropriate, and I told him its more of a gag than a trick and he would easily be found out. He said he could ask them to dim the lights. I just didn’t think it was a good idea. It involved a nylon thread that was visible. I wanted him to succeed. He wanted to try his new trick. His first trick is an appearing wand, a Mylar wand, about 20″ long. You open a closed fist as to throw something in the air and a wand appears from nowhere and you catch it. That was fine. Zig-Zag Rope, Appearing Flower..and a few others. Everything went well, I am told. Did he take my advice? I don’t know. I wished I would have told him to take a shopping bag to put the wand in after the production but I didn’t think of it until it was too late. That is something else to think about. What to do with the trick after its done, especially if the show is taking place in someone’s home where after the show everyone comes up to you when you are trying to put your stuff away. Pre Presentation, Presentation and Post Presentation. Three things you have to worry about or at least think about. Sounds like a good title for a book. But I digress. Now I come back to the original question. Criticism. Do you really want it? Can you handle the truth? And then there was the audience. It was great to see them, some I haven’t seen since they were kids. They started off at Perfect Magic. One of the performers told me I changed his life. When he came in as a little boy, I told him if he wanted to be a magician he should learn English as most of the books are in English and books are a great way to learn. He got busy and learned English and bought books and now he is performing on stage. He said its all my fault. 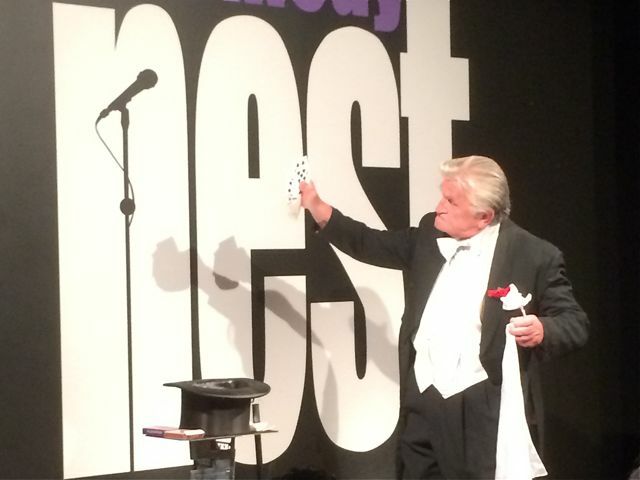 Wim Vermeys, Phil Matlin’s partner in Magie Montreal, was sitting with us with his son who is also a magician. Guy Camirand of the Academy of Magic was there and many more. I’m sure David will hav more magic nights at the Comedy Nest, based on the success of the first two. Were you there? Share your thoughts.